Doubt. John Patrick Shanley adapted his stage play for the screen. Philip Seymour Hoffman, Meryl Streep and Amy Adams teach at a Catholic school in the Bronx in 1964. 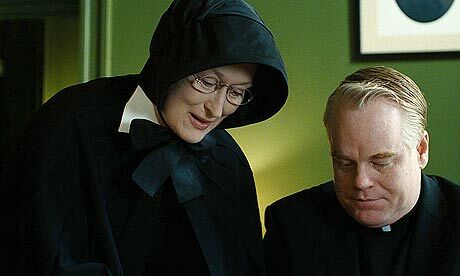 Hoffman is the “new church,” Adams is the young nun who wants to believe in his less strict methods, and Streep is the principal of the school and resolute conservative (her attack on “Frosty the Snowman” is worth the price of admission alone). A concern over Hoffman’s behavior toward an 8th grade boy drives the plot, but Shanley uses the crisis to have his characters exchange views on faith versus acts, modernity, religious liberalism, raising children and tolerance. As someone who was schooled by nuns in 8 years of Catholic elementary school, and by the Jesuits in 4 years of high school, I came into the film with certain presumptions that were difficult to stow away. I was educated by nuns, some of whom appeared to loathe children, and priests, one of whom “behaved inappropriately” with students, but neither of these realities marred what was essentially a happy and more simple time of childhood. At the time, we knew this Jesuit was problematic and it strangely seemed just part of the deal, a simple hurdle or punchline (“Don’t let yourself be alone with Father _______” or “Christ. Here comes Father _____ to the locker room again””) For the ones who were vulnerable and thus not insulated by a blase’ “he’s a little queer so watch yourself” attitude, as in the film, Father _______ was a more menacing and destructive force. I offer that because my background may have either heightened or lessened my appreciation of the picture. All the principal actors are fantastic, but Viola Davis should have earned an Oscar for her one scene as the mother of the boy.